This excerpt is from the Preface of The Soul of the World, giving a short overview the book. For many centuries, from ancient Greece through the Renaissance, the idea of living nature helped to maintain a healthy bond between humanity and the larger-than-human world in which we are embedded, and these ideas about living nature are examined in part I of this book. In the sixteenth and seventeenth centuries, a new analytical spirit emerged that was highly mathematical. Associated with the great geniuses of the Scientific Revolution, this new way of looking at the world portrayed the cosmos not as alive, but as a dead clockwork mechanism, perpetually ticking along according to eternal laws. At this time, when Western humanity was crystallizing a scientific ego, a new, charismatic image of divinity emerged, which was highly compelling to the scientific thinkers of the Enlightenment: God came to be pictured as a remote, rational, divine engineer, who laid down the laws of the universe. After the laws were set up, the universe was set in motion, and allowed to run on its own like a giant clock, after which God stepped back, only to view the universe as a spectator. At this key turning point in the development of scientific awareness, all of reality came to be increasingly pictured in terms of two main categories or principles: dead, inanimate matter, and motion, the external cause that powered it. In the process, nature came to be seen as radically other and different from humanity. Animals, for example, came to be seen as unconscious machines: if you hit a dog and it yelped, it was only an automatic response, just like the sound given off by a mechanical doorbell. The cosmos could now be modeled mathematically, and mathematics gave us control over the external world, which was coming to be pictured more and more as an exploitable resource, rather than a living community of which we are a part. This historical process, through which the world came to be modeled as a machine, is described in part II of this book. While the machine-model of the universe proved to be very useful in many ways, it wasn’t an accurate picture of the world, and over the last century or so every single premise on which it was based has been proven to be false. Matter, for example, doesn’t even remotely resemble hard billiard balls, passively knocked around by external forces; at its deepest level, matter is creative, energetic, and community building. Rather than being unintelligent, it “knows” how to act in different circumstances, how to ward off outside disturbances, and how to maintain natural structures. Similarly, living organisms don’t resemble machines at all; like human beings, they are embodiments of life’s evolutionary intelligence, which is an outgrowth of the greater natural intelligence of the world in which we are all rooted. In part III of this book, I explore the most important scientific breakthroughs or “cosmological revolutions” of recent times, in physics, astronomy, and biology, demonstrating how these new discoveries undermined the assumptions of the mechanistic worldview, and how they once again point toward the metaphor of a living, intelligent universe, in which we are not distant spectators but expressions of, and participants in, nature’s creative process. Every worldview sanctions specific ways of picturing the world and specific ways of knowing; these, in turn, sanction different ways of relating to the world and to other people. In the mechanistic worldview, for example, when the world was seen as an unliving machine, the world became pictured as a collection of objects, meant for human consumption; and nature itself became seen as an object of scientific control. Writing toward the end of the sixteenth century — and using language that is shocking to many contemporary readers — Francis Bacon wrote that the emerging scientific method would render nature “the slave of mankind,” enable humanity “to storm and occupy” the natural world, and establish the “Dominion of Man over the Universe” (see chapter 8). And while he may have been one of the first to use this kind of language, that way of thinking quickly became a widely accepted guiding ethos, at least on an unconscious level. Because of overpopulation and the related ecological crisis, we now live at a pivotal time in both human and planetary history. Since the year 1800, human population has soared 700%, increasing from 1 billion to over 7 billion today. In the last century alone, human population has quadrupled, and we now live in a period of “ecological overshoot”: it now takes the planet more than one year to absorb and regenerate what we humans take from it in a single year. In a symbolic sense, one crucial turning point came when we humans were finally able to look back and see the fragile beauty of our home planet from space. This vision, as I explore in chapter 12, transformed our way of thinking about the world and our place in it. After those stunning images, which continue to pour in, no one could be a disembodied spectator any longer when thinking about the Earth. When we experience the deeply moving beauty of the Earth seen from space, and intuitively realize that all life is bound together, facing a common fate, we automatically sense ourselves as participants in life’s tapestry, not as disembodied spectators. 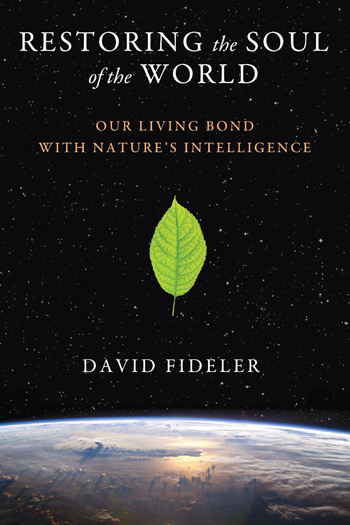 The idea that nature possesses a living intelligence is not something of just historical or academic interest; I wrote this book out of my strongly held belief that a deeper and more accurate worldview is needed if we want our children to inhabit a beautiful and flourishing world in which life is truly worth living. In this sense, The Soul of the World is not about the past, but about our own time and the future. In part IV of this book, I discuss how we are beginning to see hints of a new, emerging worldview, based not on the idea of exploitation, but on the idea of learning from nature — and collaborating with nature’s intelligence — to create a better, more healthy, and more fulfilling world for all. If both human beings and the living planet are going to possess a flourishing future, gone are the days in which we can think of ourselves as the masters and controllers of nature. The alternative to control is a spirit of partnership, in which we would work in collaboration with nature’s living systems, a topic explored in this book’s final chapter. At its deepest level, the new science of ecological design shows how we can solve our most pressing human problems by drawing upon, and working with, the genius of nature’s design intelligence, developed and tested over the course of 3.8 billion years. In one stunning example, ecological designer John Todd has shown how it is possible to collaborate with communities of living organisms to turn wastewater into pure water and how to restore some of the most toxic waste sites known to humanity. In purifying extremely highly toxic bodies of water with the help of living organisms, John Todd has shown how it is possible to help regenerate degraded ecosystems in very short periods of time — weeks or months — that would normally take decades or even centuries to restore without human help. While species loss is not reversible, the Earth’s living systems are resilient (until they reach a certain point), and regeneration is possible. We already know how to make this happen. Should we also possess the love, desire, and will needed to accomplish it, through the use of ecological design, we humans — working in true collaboration with nature — could restore health to the world’s living systems, and radically reduce our own ecological footprint. Copyright © 2013 by David Fideler. All rights reserved. No part of this text may be duplicated or republished in any form without the permission of the author.